A. Ruimy, P.G. Jarvis, D.D. Baldocchi, and B. Saugier, CO2 Fluxes over Plant Canopies and Solar Radiation: A Review. A.E. Douglas, The Ecology of Symbiotic Micro-organisms. D.A. Wardle, Impacts of Disturbance on Detritus Food Webs in Agro-Ecosystems of Contrasting Tillage and Weed Management Practices. A. Rossiter, The Cichlid Fish Assemblages of Lake Tanganyika: Ecology, Behaviour, and Evolution of its Species Flocks. T. Tregenza, Building on the Ideal Free Distribution. D.J. Booth and D.M. Brosnan, The Role of Recruitment Dynamics in Rocky Shore and Coral Reef Fish Communities. References. Subject Index. Cumulative List of Titles. This volume contains papers highlighting the diverse interests of modern ecologists. 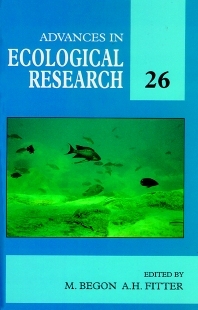 All areas of ecology are covered: from the current concerns over changes in CO2 levels and its affects on the Earth's vegetation to the unique Cichlid fish populations in Lake Tanganika, whose structure is important for other organismal populations, including humans. Other theoretical and applied ecological studies are also discussed, making this volume essential for all ecologists.